I’m often asked, “What’s it like to live in Anchorage?” “It’s urban and modern,” I explain, “but lies on the edge of a wilderness where you could get lost for months without seeing another soul.” This image captures the seemingly endless, untouched wilderness of the Chugach Mountains. I’ve flown and hiked these mountains countless times. But on this particular evening, everything comes together: Mystical light bathes the hills. Snow blankets the deep valleys while the warming February sun has exposes the south-facing rock, creating contrast. I position the helicopter a mile and a half above the terrain to reveal the sea of wilderness that is the Chugach. And I wait until after the sunset to capture a world of quiet and mystery, seldom experienced from this vantage point. Separated from Anchorage by 90 miles of rugged wilderness, BlockadeLake is a spot where few humans have ever set foot.The lakebed is accessible only by helicopter, and only in years when a glacial dam bursts and empties the lake in a way that leaves behind a safe place to land. The lake drains every few years, strewing massive icebergs across an eerie landscape that only a week before lay under hundreds of feet of water. I scouted for hours to find an ice formation that I thought would be safe to approach. Looking up through this ice cavern—with the bright summer sky luminescing different wavelengths through varying depths of ice—I knew I had found what I was looking for. The most remote and inaccessible zones of Chugach State Park can be rugged almost beyond belief, especially where faces have collapsed and eroded over geologic time. One spring day, while flying along a snowbound mountain at about 7000 feet, I found this series of crags and pinnacles leaning preciously over a chasm. A winter of blowing snow had crowned them with elegantly sculpted cornices that reminded me of fins. It took many passes of patiently maneuvering the helicopter on the leeward side of the mountain to set up and hold position for this image. I have flown for hours and hours exploring the hillsides and glaciers flowing from the flanks of Mt. Spurr, an active volcano 90 miles in the wilderness. A year after I moved to Anchorage, it erupted, showering the town with ash and shutting down air travel for days. One day while flying In the vicinity of a glacier on its flanks, I discovered a unique landscape I have seen nowhere else. Formed by an ancient eruption of the volcano and carved through the millennia by torrents of water, it looked like Mother Nature’s secret golf course. I landed the helicopter on a ridge high above and put a hiker on the landscape to show its mind-boggling scale. This image is available both with and without the hiker. I had been staying at a lake deep inside Katmai National Park for several days. My last night, just after dinner, I observed the ingredients brewing for a truly unique composition: The skies were generally clear, but with enough clouds to know a fiery sunset was on the way. I waited until a few minutes after the sun dipped below the horizon and used an 80-second expos. The renowned Harriman Expedition discovered College Fjord in Prince William Sound in 1899. John Muir, the famous naturalist, was aboard, as well as a Harvard and Amherst professor who gave the name “Harvard” to the massive glacier at its head. More than a hundred years later, the world can now see a view Harriman and Muir could only dream of—from inside the glacier looking out. On a glisteningly clear spring day, I flew almost an hour to the glacier, then hovered slowly across its mile-and-a-half wide face for 45 minutes to find the perfect angle to show both the inside of the glacier as well as the stucco debris it had cast off into the fjord, 200 feet below. Maneuvering a helicopter in tight quarters with icy pinnacles is tense; the rotors are actually below the level of the ice upslope from us. On the first day I used my new Phase One camera, I flew my helicopter into the mountains northeast of Hatcher Pass and landed near this tarn in a pocket above a deep valley. Green moss covered the rocks, and the aquamarine water lay still and calm, the very image of alpine serenity. But only 100 feet downstream, the outflow gushed over the lip of a cliff and plunged down the mountainside in a massive, foaming waterfall. The transformation reminds me a bit of life and how we never know what’s lurking around the corner. A moment that feels so peaceful and placid can be followed by turbulence that upends everything. Minty green water becomes blazing white. While flying across remote landscapes, I’ll sometimes see a bush plane landed on a river gravel bar or even a flat mountain ridge. Seldom have I ever seen one on wet, tussock-peppered tundra—a surface that could shear the landing gear right off a plane. It was with no small measure of disbelief when I spotted a plane in the midst of flat, featureless tundra one September evening, the peaks of the Alaska Range looming on the distant horizon. Just before sunset, the scene perfectly captures the freedom and beauty of America’s last great wilderness—and the independent spirit of those who live on the frontier. Though they might look static, glaciers are actually rivers of ice flowing with real power, albeit in slow motion. Sometimes they ripple over obstacles like standing waves in a rapid. Sometimes they crash together in dueling cascades. 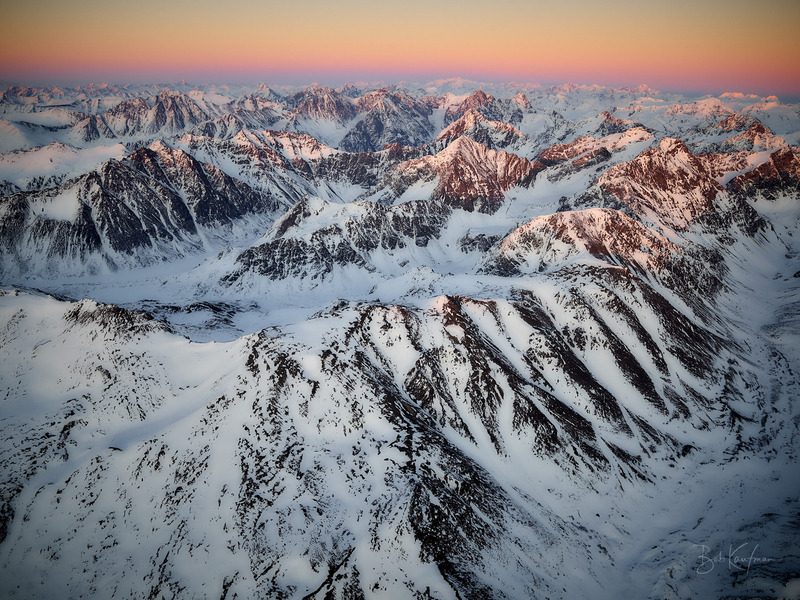 Deep in the rugged glacial wilderness south of Chakachamna Lake, about 90 miles west of Anchorage, I flew over this bowl of intersecting glaciers as the sun was setting on a mid-September day. These glaciers were all converging on each other, merging with a hint of arrested violence, topsy-turvy in every direction. High on the Knik Glacier, two vertical miles above Prince William Sound in the Gulf of Alaska, lies a sweeping icefield that has seldom felt the press of a human foot. After a long day of aerial photography in the valleys below, clear skies beckoned me to explore this mysterious territory I had only seen on maps. Mile after mile of untouched glacier spread out below as I ascended higher and higher up the glacier, racing against time to get to the pass before sunset. Alas, with the shortening days of late September, the sun dipped below the mountains of Prince William Sound before I got there. What initially felt like a disappointment turned out to be a blessing in disguise as gauzy pink and cobalt hues bathed a rarely-seen wonderland of mountains and glaciers. One cold January afternoon, I flew my helicopter above the Anchorage Hillside with my original flight instructor along as co-pilot. I had hoped to capture an image of the city against the ice-bound inlet, but a cloud bank intervened. With sunset outlining three Cook Inlet volcanoes on the horizon—Iliamna, Redoubt and Spurr—we hovered over a scene that had the look and feel of uninhabited country. I was struck by how Alaska’s geography often dwarfs and hides its human footprint. One of the state’s busiest highways runs along the base of this mountain, but it’s a mere ribbon across the landscape. The largest city within a thousand miles is below and a few miles to the right. But you’d never know it. By late summer, the snow has melted completely from the surface of lower Knik Glacier, exposing the rippling seracs of flowing ice covered in silt that has been carved from the surrounding mountains over millennia. This view—where the medial moraine defines the merging of two glacial lobes—reminds me of a winding country road. In the far distance, you can see the tip of Lake George Glacier, above where it meets the Knik, and close to where they both feed the Knik River in its rush to the sea. More than 20 million tons of pulverized bedrock and sediment flow into Knik Arm each year, most of it ground off these mountains and then carried by the Knik River. The mud flats of Cook Inlet owe their existence to the erosive power of this immense glacial conveyer belt. The ebbing tide exposes extensive mud flats twice each day in Turnagain Arm, only a few miles off the coast Anchorage. The extreme scale of the view I find out there while flying in my helicopter is hard to grasp. Point Possession­—the uninhabited northwest tip of the Kenai Peninsula—forms a dark line only about ten miles from the location of this image. But the massif of Mount Spurr volcano and the rugged Aleutian Range loom over a horizon 70 to 100 miles further west. This vast, unbroken vista is both humbling and exhilarating. Sometimes clouds can shroud the Alaska Range so completely that nothing can be seen, making flying even more challenging than normal. But on this particular evening, I discovered a sunset glowing over a bank that had nestled perfectly among the Kichatna Spires. There were gaps in the cover that would allow me to descend if necessary. So I stayed high, photographing a world where mountain summits stood like islands in a lustrous, silken sea thousands of feet deep. It reminded me of the Chugach Mountains rising from the ocean and fiords of Prince William Sound. The timeless, fluted cliffs of the Kichatna Spires in Denali National Park rise thousands of feet, forming broad walls that draw world-class climbers and make spectacular photos. I thought I knew them. But then, on a September day, I began capturing images straight down from my helicopter and was unsettled by the view. I had sought to capture a sense of their height and geology by using a new perspective. But what I found felt mystical, as though the walls had come alive and were growing toward me. They were penetrating the clouds like a giant fairytale beanstalk, offering a path to a magical realm far above the earth. One of Alaska’s natural wonders, permafrost is ground that remains frozen year-round, sometimes thousands of feet deep. In summer, it provides a frozen floor above which water can pool, birds can gather, wildflowers can flourish, and the land can come alive.As its surface layer thaws and refreezes during season after season, the permafrost rumple sand morphs the surrounding earth. It etches patterns on the landscape that can often be seen only from the air. This undulating patch of bog, which lies in the wilderness 50 miles west ofAnchorage, shows the artfulness of nature’s hand as well as any I have seen. Tucked into the far southwest corner of Denali National Park lies the Kichatna Spires, a realm of vertical granite known only to a few ambitious climbers and wilderness adventurers. When I set off for the 90-minute helicopter flight one late summer day, I had no way of knowing what the weather or light conditions would be upon my arrival. What awaited me was some of the highest walls on earth draped in sublime clouds—what we call the “lingerie effect”—and it was exactly what I was hoping for. 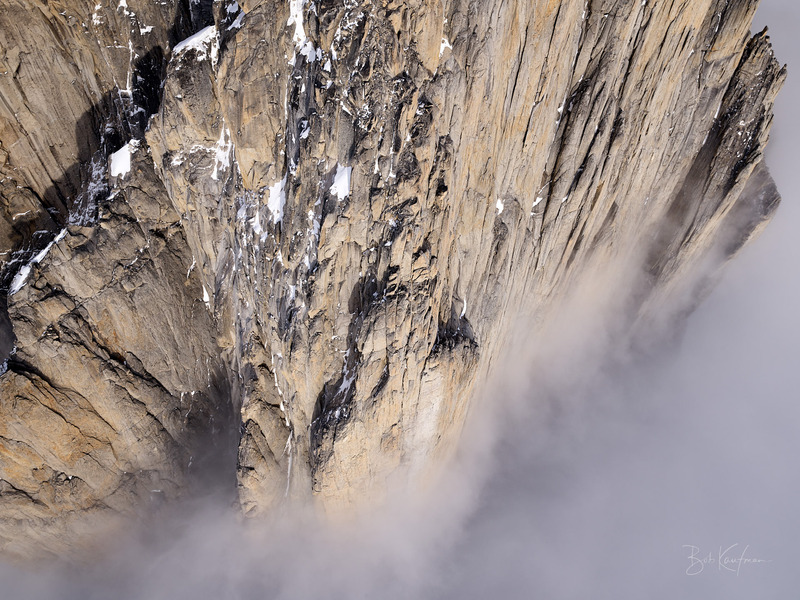 Composing images while flying a helicopter off sheer rock faces is both exhilarating and exacting. Everything came together in this image to show what I consider to be one of the most spectacular spots on the planet. I’ve sometimes found rivers flowing over the surfaces of melting glaciers, and I’ve often seen streams gushing along their lateral moraines. Water takes the path of least resistance, so you wouldn’t expect to find a river cutting straight across a glacier. But on one hot July day, during a period with 18 hours of intense sunlight. I landed my helicopter on the ice near Lake George and discovered exactly that. Over the lip of a cliff, a brown torrent had sliced a channel through the glacier itself, surging though a canyon between ice walls 75 to 100 feet high. I crept to the edge and carefully positioned my tripod to capture this shot. When I returned a week later, the perch where I had taken the photo was gone, consumed by the river. By September, all of the ice in the left of the image had collapsed and been flushed away. I learned you should never underestimate the immense power of water in its ability to change the landscape. Still, I’ve returned many times to the area and never again witnessed a river bisecting a glacier like this. It may be a scene I never see again. There are still places on earth beyond the encroach of humanity. Alaska is one such place. Here, a vast, untraveled glacier glows rose purple in the final rays of a February evening. Quiet has not “descended upon the land“—for the land is always quiet. Look into the distance. Vast, open country speaks to the wilderness that is America’s Last Frontier. The granite spires of the Kichatnas tower over timeless glaciers that continually sculpt their flanks in slow motion over eons. And yet, sometimes this enduring landscape changes in an instant. Massive rockslides—sometimes triggered by earthquakes—can cascade from the mountains to swallow whole valleys in fresh rock. While flying one summer day, I discovered a new rockslide that had plunged to bury the glacier in lobes of rubble reaching downhill. It struck me that I was witnessing the tick and flow of geology in real time. Eklutna Lake nestles high in Chugach State Park above Anchorage, providing residents with both exceptionally pure drinking water and extraordinary scenery. By late September, the foliage burns golden and auburn, This view captures the southern head of the lake, where sheer mountains tower over a remote valley, only a few weeks before snowfall. I was struck by the colors and the shadows, and the crisp reflection of the terrain in the lake’s mirror surface. To me, they conveyed the mood of quiet and repose that comes before the long winter. Alaska’s long, frigid winter often plays with the flowing water of creeks, with cold snaps building formations and sudden thaws molding them into new shapes. Nowhere is this process more otherworldly than beneath the ice itself. I found these fluted and intricate shapes one January along Campbell Creek in Anchorage. A collapsing shelf had opened a view into a dark cavern above the surface of the water and below the covering ice. The icicles resembled stalactites, but with the elegant lines of lathe-carved spindles. On a wilderness trek years ago, myself and a companion found ourselves stuck on the shore of shallow Kenibuna Lake, near the Lake Clark Preserve about 90 miles west of Anchorage. Our plan called for us to cross in rafts, but thick muck saturated the water, making paddling impossible. When we tried hiking, we sunk to our waists. So, as often happens in Alaska, we had to yield to the wilderness and travel in another direction. I returned to the scene recently in my helicopter, arriving just when the setting sun cast a shadow across the center of the vast flat. It threw contrast across two remarkable mirror-like ponds—deeper and more pure than the surrounding silty lake—that reminded me of monocles. A proud cornice surveys a seldom-touched sea of mountains deep in the wilderness of Prince William Sound. A labyrinth of cobalt blue bays, impassable glaciers, and tidal-deluged beaches defend these distant peaks and valleys against the approach of all but the most committed and intrepid adventurers. The mist rose from Moraine Creek in the chilly September dawn. As we walked along a stream filled with spawning salmon, the air sharp with the odor of rot and the cries of birds, we came upon a brown bear who seemed to share the same plans for the day—fishing in the fine fall weather. Humans and bears have shared this landscape in a remote area of Katmai National Park for hundreds if not thousands of years, and today would be no different. The big bruin looked at me, meeting my eyes, and continued on its way. As I was flying over this ice field in the Chugach Mountains late one evening, I found this lonely peak illuminated with alpenglow cast by the setting sun. Known as nunatuks—an Inuit word born from Greenland’s massive ice sheets—these often startling prominences stand over remote basins of ice like sentinels, often the high spot of a ridge dividing one glacier system from another. For a few fleeting minutes, this particular feature captured the fading day like a beacon, while magic light kissed the ice below and beyond. While flying home one September evening after a 300-mile day of airborne photography, I crossed over a rugged and almost inaccessible basin within the Neacola Mountains. It was still and calm, dimming with the day’s last light, beneath brilliant skies dappled with glowing clouds. Not fully explored even now, the Neacolas are the most northern reach of the Aleutian Range, about 150 miles southwest of Anchorage. With difficult approaches and no marquee peaks to attract attention, this basin remains a spiritual place rarely visited by people. The colossal tides that flush Turnagain Arm sculpt the silt into unpredictable shapes, ever changing and beautiful. I found these S-curves emerging from the ebb on a bar off the Gull Rock coast of the Kenai Peninsula a few miles west of Hope. Their undulating pattern seemed remarkably consistent from the small scale to the large. But I knew it was ephemeral, lasting only until the next cycle of the tide. It struck me that I was witnessing nature’s art show, painted twice each day by nature’s hand. Nature draws it for you. You see it, and then later, it’s gone, erased by the coming flood. I think about all the beauty no one’s ever seen–and the fact that I just happened to catch this one. Glacial ice often dams Strandline Lake, allowing it to fill to the brim with melt water from the Tordrillo Mountains about 70 miles west Anchorage, near the foothills of Mt. Spurr volcano. When such dams burst, they can release floods that gush downstream with Biblical-scale violence—valley carving phenomena known by their Icelandic word of jokulhlaups. After one of Strandline’s annual summer floods, I found an eerie landscape littered with stranded and fluted bergs, some towering ten stories high. The lake’s aquamarine waters gleamed with startling contrast against the silt-gummed ice, proving that glacial dynamics don’t have to be monochromatic. A ridge runs along the immense, shattered Knik Glacier, miles and miles above its terminus, offering a stunning overlook of the place where its two main forks merge beneath the 10,610-foot Mount Goode. This location would be all but impossible to reach without a helicopter. And yet, once there, you could walk slopes that seemed to extend for miles. I think about all the other islands of idyllic beauty that lie surrounded by rugged terrain all across Alaska, still waiting to be noticed and explored. An immense wetland crowns the top of Cook Inlet, mile after mile of lakes and kettle ponds and marsh. Only 25 to 30 miles from Anchorage, this little visited realm of sedges and grass west of the Susitna River concentrates thousands of nesting birds during the season. It’s so wet, with virtually no solid ground and few interconnected channels, no one goes there in summer except by air. I visited in late August, after the birds had gone, when vegetation was just beginning its color shift. The country seemed austere and quiet, with dark clouds looming over Mount Susitna like harbingers of the cold to come. 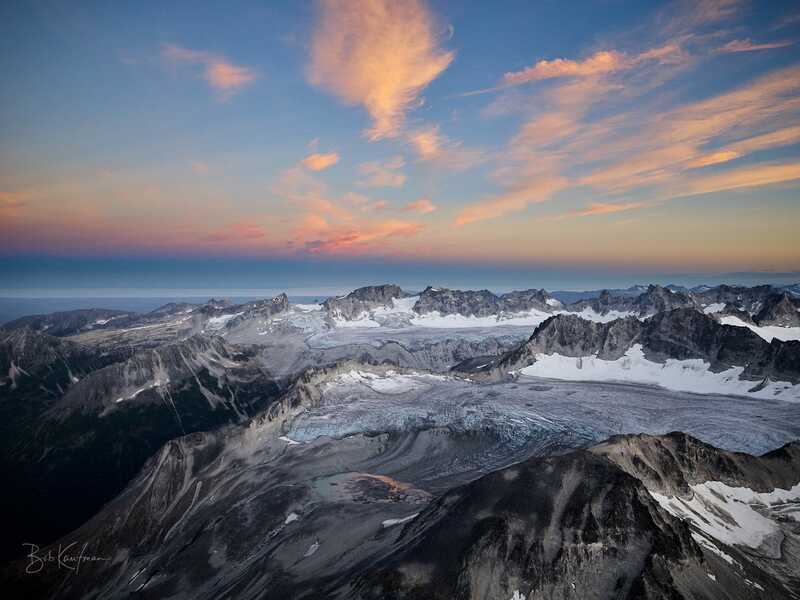 In the mouth of a valley leading to Blockade Lake and its glacier looms a lone, craggy mountain, soaring hundreds of feet above the surrounding landscape. I found it while exploring the wilderness approaches to the glacial-bound mountains south of Mt. Spurr volcano. Eons of geologic forces—ice ages, earthquakes, grinding erosion—removed everything around it. And yet this rocky monument remains. At the same time, its pinnacles and ledges are festooned with lichens and moss, a harsh ecosystem onto itself. Life prevails in the most harsh locales. Late one fall evening I flew many miles up the Knik Glacier northwest of Anchorage until I found the highest band of vegetation. Just as the sun began to drop behind the ridge, I landed in a safe place, and dashed to a spot where I could capture the last rays of the day. They set this patch of vegetation aglow, an austere biome tucked above and below realms of gravel, rock and ice. It was quiet there, with a chilly breeze, maybe only a few days before winter’s snow would bury it. The dwarf alpine blueberries and lichen had browned, and yet, fruit and leaves remained on the stems. The tundra clung to life on this hillside. A friend of mine owns a cabin on Lost Lake, located on other side of Knik Arm from Anchorage. It takes 90 minutes to drive there, but only four minutes to fly. One summer afternoon, we’d planned to meet with our aircraft to take photos of his cabin against the sunset. But when I looked at the weather cams, I saw clouds had started moving in. So I raced to the hangar to get the helicopter while he raced to Lake Hood to get his floatplane. By the time we were airborne, the clouds had obscured the horizon, and I was disappointed. But after we landed, I realized the clouds were bathing the lake in a special light. I took off first and positioned the helicopter above and behind him with safe aerial separation. He fired his single-engine plane and hydroplaned across the lake. As he gained speed and slowly got on step, the floats plowed through the water, slicing the glassy surface. The white streak of his wake and the splatter of his spray—captured seconds before he rose into the air—transformed the scene for me. I knew it was the element that made the photo. This image visually expresses what it feels like to fly in Alaska. From its origin as a cataract surging from beneath a glacier in the Talkeetna Mountains to its final, lazy meander across wetlands bordering Cook Inlet, the Little Susitna River is a shape-shifter, a creature of many moods. Over 110 miles, it morphs from a boulder-strewn mountain stream near Hatcher Pass into a popular salmon river suitable for boating and sport fishing. It begins full of wild energy, rushes past rural suburbia north of Wasilla, and ends quietly amid marsh and tide far from civilization. I visited this final, silty reach late one summer evening, when the foliage had begun to turn. Nearing the end of its journey to the sea, the river here seemed tranquil in an empty land, if not a bit lonely. Not unlike old age, it is no longer as attractive as it was in its youth, high in the mountains. It no longer runs straight and strong, but rather meanders slowly and reflectively to its end. I didn’t have much time. The sun was plunging, the good light dying. I rushed down a boardwalk extending into Potter Marsh—a wetland in south Anchorage beloved for its natural setting and wildlife viewing—hoping to find an image that conveyed the mood of the serene fall season. I caught sight about 100 yards away of the old, toppled tree trunk in a mirror-like pool. Perfect. I climbed over the railing, trudged through the marshes, sunk into the muck, and set up my tripod with one leg in six inches of water. In minutes, the glow disappeared and the scene darkened. But I had caught the moment in the quickest shoot of my career. I was ten minutes from my home, shoes soaking, caked with mud, and exhilarated. We had been dropped off by floatplane just before dawn, on a fishing trip to Moraine Creek in Katmai National Park. As we splashed through the braids of the stream toward our first fishing hole, the ripe odor of rotting salmon filled the chilly September morning. Bears were along the river, too, fattening up on spawners before winter. Birds wheeled overhead, feasting on any carcasses left behind by the bears. It felt like a timeless Alaskan moment of life, death and rebirth—the fish struggling to deposit and fertilize eggs in the gravels before they died, the wild animals feasting on the bounty, and us, the humans, sharing in the catch. I dashed along the riverbank and crashed through the willow to frame this shot before our guide plunged into one of the deepest pools. It caught him in midstride, leading us down a river rich with wild salmon. It was late in the season when I landed my helicopter beside the Chickaloon River, about 30 miles upstream from its confluence with the Matanuska in the Talkeetna Mountains northeast of Palmer. The spot I found was deep into wild country, far from any trail or habitation, very difficult to reach. It was probably only a week from snowfall. On that day, the foliage glowed with the setting sun and the final warmth of summer. I set up my tripod along the crystal water. A five-second exposure captured the river’s flow and the glimmer of the late-season magic light on its wavelets. An incredible number of salmon converge on Kulik Lake in late summer. Many brown bears patrol the shore all day long, lunging for fish in the shallows and then gorging on their catch. I was sitting on the deck of a lodge when this big bear ambled past. He looked at me, noted me, and just kept going on his way. He and I were both enjoying the same beautiful evening after long hours of fishing. January’s frigid temperatures can freeze the sea of upper Cook Inlet, coating mud flats and rocks with an ice sheen. The tidal ebb and flow molds boulders from ice and mud that litter the shore. As the season goes on, they slowly grow larger with each cycle until they eventually start blocking access to the water. To capture this photo, I walked about 50 yards from the Seward Highway to stand among them on the beach of Turnagain Arm, right across from the Kenai Peninsula. It was near high slack tide, very cold and quiet, with a slight current whispering against the mud. It was about three weeks after winter solstice, a time of year when Turnagain Arm seems to glow from sunrise to sunset in weak, orange light. I hovered in my helicopter in the middle of the fiord only a few miles off the Kenai Peninsula coast. A river had formed with the falling tide, draining the mud flats and allowing the temporary high ground to frost over. It was a detailed, textured landscape of countless ponds, ripples and ridges. It would vanish when the tide returned.